"I had two timeouts and I wasn't going to leave with those in my pocket," Joseph said. "So, just ice the kid and see how he reacted." On the re-do, Harris - who made the team largely because of a rash of injuries along the D-line - sliced through and got his right hand on the kick. It was reminiscent of last year's opener, when the Broncos escaped with a 21-20 win over the Carolina Panthers when Graham Gano missed a 50-yard field goal with 4 seconds left. "The game was in firm control for about three quarters there and we felt good but you turn the ball over twice on the short side of the 50, it's going to be a problem with Philip Rivers," Joseph said. Von Miller presented Joseph with a game ball in the jubilant locker room. "It wasn't clean, but it's good to win," Joseph said. "It's a hard league. Every week is going to be a challenge, so a win's a win. We'll take it." Safety Adrian Phillips intercepted a pass that went off cornerback Desmond King's leg as King was tackling Fowler while the ball was still in the air. A review upheld the turnover and L.A. pulled to 24-14 on Keenan Allen's 5-yard TD catch with eight minutes left. Less than a minute later, Charles fumbled - although replays showed his left elbow was down before the ball was ripped away by Korey Toomer. Cornerback Casey Hayward recovered. One play later, Rivers hit Travis Benjamin for a 38-yard touchdown that made it 24-21 and safety Darian Stewart hobbled off with a strained groin. Back-to-back sacks of Siemian set up a 50-yard field goal try that McManus pushed wide right, giving L.A. the ball at its 40-yard line. But Koo's miss loomed larger in the final seconds. Los Angeles' only touchdown drive was aided by a 40-yard pass interference call on cornerback Bradley Robybefore Rivers hit running back Melvin Gordon for an 11-yard touchdown toss. Safety Justin Simmons hit Gordon at the 2, but he just somersaulted across the goal line. Rivers stayed away from the All-Pro tandem of Aqib Talib and Chris Harris Jr., instead targeting Roby and safeties Stewart and Simmons. Roby atoned for his crucial penalty with an interception in the third quarter on a pass intended for Allen. That led to Siemian's 6-yard TD toss to Fowler that made it 21-7. Beth Mowins became the first woman to call an NFL regular season game since NBC's Gayle Sierens in 1987 when she handled play-by-play on the doubleheader nightcap alongside Rex Ryan, who made his debut as an ESPN analyst. MCMANUS'S MILLIONS : McManus was the last restricted free agent to sign his tender this summer, waiting until June 15 to put his signature on a one-year, $2.75 million deal after making $600,000 last season. He did it in hopes of getting a long-term deal, which he finally got Monday just hours before kickoff when he agreed to a three-year extension worth $11.25 million. 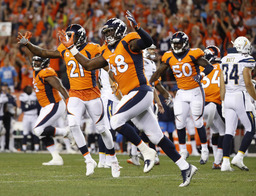 A first-time team captain, McManus approached coach Joseph before the final preseason game and talked him into allowing the special teams players to participate in pregame introductions: "First time at any level, high school, college or NFL," explained McManus. "It's a huge dream of mine to come out to 70,000 fans cheering." BEEFY BRONCOS : The Broncos beefed up their depleted defensive line before kickoff by promoting rookie nose tackle Tyrique "Pot Roast Jr." Jarrett to their active roster and waiving Kyle Peko. The undrafted pro from the University of Pittsburgh is generously listed as packing 335 pounds on his 6-foot-3 frame. His teammates gave him his nickname because he reminds them of former Broncos run-stuffer Terrance "Pot Roast" Knighton.